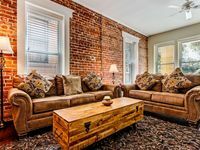 2 BDRM Luxury Boho house, eclectic, artsy, historic walkable. Close to bars. Property 2: 2 BDRM Luxury Boho house, eclectic, artsy, historic walkable. Close to bars. Property 8: Seconds away from the fun in Historic Riverside! NEW! Eclectic Jacksonville Home - 10 Mins to DT! Property 28: NEW! 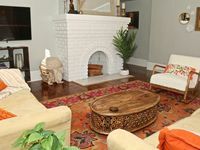 Eclectic Jacksonville Home - 10 Mins to DT! Property 30: Riverfront retreat just across from downtown, hospitals & stadium. Property 31: Jacksonville Smart House w/ Yard - 1 Mi to Dwtn! Property 32: Walkable Historic Avondale Bungalow w/ 3 BR's and Free WIFI! Great Yard - Close to Downtown Jax! Beautiful Victorian House in Historical Avondale are in Jcksonivlle, Fla.
Property 37: Beautiful Victorian House in Historical Avondale are in Jcksonivlle, Fla. This part of Jacksonville is undergoing a renaissance and is beginning to develop a kitschy vibe. The the place is clean and well appointed -- you may think you are in Soho NYC. The hosts left all kinds of goodies and more than enough literature to guide you if you need it. We found two nearby rooftop places to eat (Cowford Chophouse and River &amp; Post) and found them both fantastic with great views.